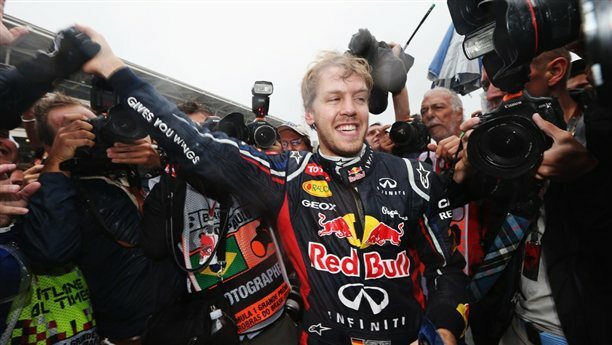 Red Bull’s Sebastian Vettel became Formula One’s youngest triple world champion at the age of 25 after a wet and chaotic Brazilian Grand Prix rollercoaster won by McLaren’s Jenson Button behind the safety car on Sunday. The German, needing only a fourth place to join the greats as the first driver to win his first three titles consecutively, finished sixth after fighting back with a damaged car from last on the opening lap. It proved enough after his sole rival Fernando Alonso, needing victory, crossed the line in his Ferrari in second place with Brazilian Felipe Massa third. “You’re a triple world champion. You’re the man. You are a triple world champion,” shouted team principal Christian Horner over the team radio as Vettel crossed the finish line after what he said later was the toughest race of his career. The team could not hear his reply, or his choked sobs of joy, because the radio was faulty and had been only incoming for most of an afternoon that threw one obstacle after another at the champion. Vettel ended the season with 281 points to 278 for Alonso, who would have been the youngest triple champion at 31 had results fallen his way. Kimi Raikkonen was third overall for Lotus on 207 in his comeback year. Red Bull had already won the constructors’ title for the third year in a row. “It’s very difficult to find the right words, especially after the race today,” said Vettel. “I think everything that could go wrong, went wrong. On a day when the Brazilian weather produced a thriller to stand the test of time against some of the sport’s great races, it seemed the gods were on Alonso’s side almost as soon as the starting lights went out.